Standards are tools to disseminate information. They provide reassurance that the goods and services they concern are reliable, safe, and will perform the required service. Many existing Standards have developed in response to user, industry and consumer needs for up-to-date requirements and recommendations. As a result, they protect Australian tradesmen, their customers, and the end users. We hope this article provides insight into emergency and exit lighting standards and why it is important to comply. Exit and emergency lights are an essential life-saving device. They ensure safe egress for building occupants when the normal lighting fails or visibility is impaired, either due to smoke or power loss, during a fire or other emergency. This is done through a variety of ways. Emergency escape lighting provides illumination to enhance vision for the safety of people in the area. 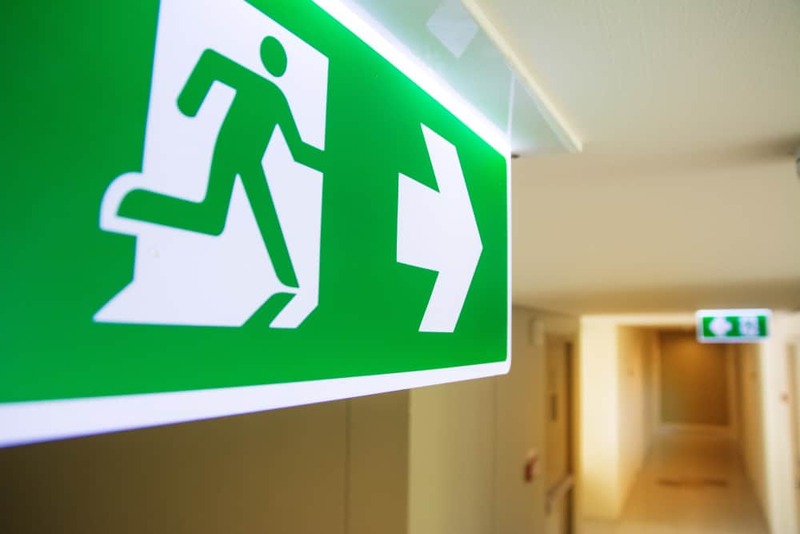 Whilst illuminated emergency exit signage, colloquially referred to as ‘exit signs’ communicate the paths of travel to a designated exit by displaying an appropriate image. As a general overview, upon failure of the electrical supply to the normal lighting in the area, each emergency escape light and exit sign will be energised from its internal battery supply and become illuminated. To ensure that this is possible during an emergency situation, Australian Standards require that exit and emergency lights be tested every 6 months and remain illuminated for at least 90 minutes whilst running on their battery power, except where applicable building regulations specify. This is done by simulating a failure of the normal monitored supply. Any emergency light or exit sign that fails to stay illuminated for the full 90 minutes should be either repaired or replaced. Standards frequently change in response to new information and product development so it is important to stay up to date. Initially, exit signs displaying a decal with the word ‘EXIT’ were widely used, however since an update to standards in 2006, all new exit lights installed are required to have the pictograph of a running man as it offers increased visibility and information through the indication of the direction of the exit. Even though changes to existing exit signs are not necessary, many businesses chose to upgrade to the running man pictogram for greater safety of clients and staff. The Standards governing emergency lighting have been in circulation since the late 1970s, and the importance of compliance in emergency lighting is not a new or negligible issue as they have the power to save people’s lives. Please contact Fire Safe ANZ for any enquiry related to exit and emergency lighting systems.